As first card you drew "The Wheel of Fortune". The main meaning of this tarot card is: The card stands for the incessant movement of the universe and the flow of human life. You will devote yourself to a new task. You can now tackle tasks that have not yet been solved.. It generally means: Fate, life’s mission, dissolution and new beginning. 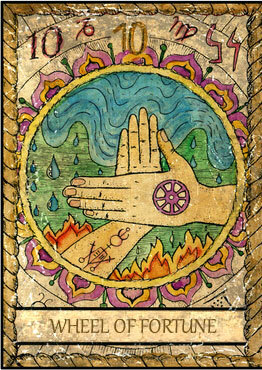 The card "The Wheel of Fortune" also stands for: Happiness, success, abundance, evolution, change, skill, reward and blessing. Reversed it points to: Atonement and nullity. You drew "Princess of Wands" as second card. 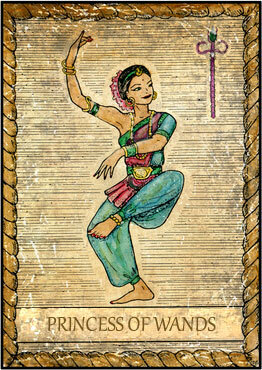 The main meaning of this tarot card is: Good, inclined, friendly woman. Love of money. Love of art. Flattery. Desire for luxury.. It generally means: A talented, artistic and passionate woman. 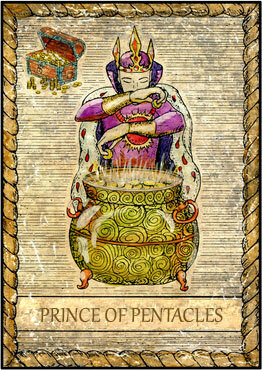 You drew "Prince of Pentacles" as third card. The main meaning of this tarot card is: The King of Pentacles reflects the safety and practicality. Such a person will be important for the questioner. Beware of the evil will of a man pages. Dark man.. It generally means: Rooted, quiet and natural man. The card "Prince of Pentacles" also stands for: Intelligence, transactions, predictable success, businessman, master or Professor. Reversed it points to: Vice, weakness, perversity, danger, loss, age and malicious man, hypocrites. 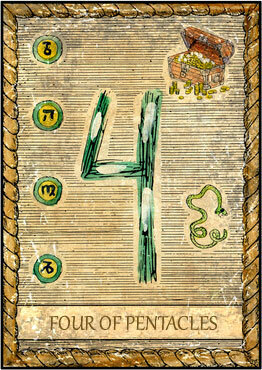 Your fourth card is "4 of Pentacles". The main meaning of this tarot card is: Staying still and being stuck. Suspicion. Being rigid and retracted. Pleasant news from a woman.. It generally means: Stability, rigidity and heritage.